In, items are physical objects that a player may have in their inventory or bank. Players distinguish them by their names and graphics. The game additionally seems to distinguish items by ID numbers that are not visible to players in-game. 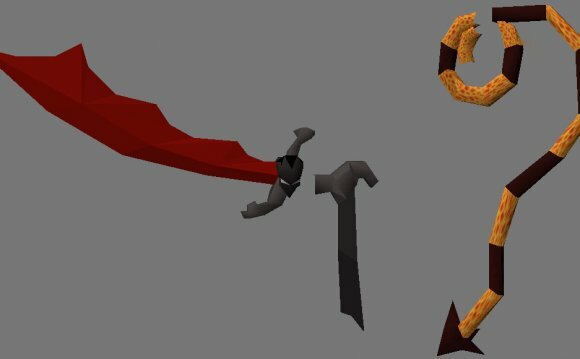 ID: All of the items in RuneScape have a unique number that identifies it, invisible to players in-game. Only one item has the same ID, unlike how multiple items can have the same name. The ID of an item can be used to lookup Grand Exchange prices and get additional information about an item from the database, such as the examine text and value. Seemingly identical items may have different IDs as they are used for different purposes. Unobtainable items, such as a Zaros mjolnir, exist within the game's code, have an ID number assigned to it, but are never seen via normal gameplay. Instead, they are found within the game's cache. Graphics: All obtainable items have graphics. There are four main types of graphics items may have: All items may be held in the inventory and therefore have inventory pictures. This inventory picture also appears in the Grand Exchange box and the equipment screen, albeit its outline and shadow may vary. The inventory picture is actually a 3D model, though it is only shown at one angle and has an outline (usually) and shadow added to it. Most textures, also, currently do not appear on inventory icons. Items may actually be seen in 3D when dropped on the ground, and will use the same model as their inventory icon (they may, however, appear at a different size or orientation, and will also be affected by graphical settings such as textures). The third kind of item graphic is equipment that is equipped on the player, which is a 3-D model that is usually more detailed than the inventory/dropped appearance. A fourth appearance for items is an appearance in a chatbox, such as when an NPC gives you an item, and it appears as a larger version of the inventory icon (with textures). In addition, some items may have graphics for other situations, such as animations, POH mountings, or the player's head when talking to an NPC. All of these graphics will usually look similar to each other, normally only varying in detail. Name: Most items have a unique name for that particular item. Some may have the same exact name, yet have different purposes.